TOKYO, JAPAN — NTT DOCOMO, Inc. announced today that it has developed what is believed to be the world’s first 8K virtual reality (VR) live video streaming and viewing system for showing live events in 360° 8K VR video. A head-mounted viewing system creates highly realistic VR experiences for enjoying music and sporting events that allow viewers to feel as if they are actually at the venue. The heavy demands of processing 4 x 4K video for real-time stitching and compression into 360° 8K video is difficult to achieve with software. DOCOMO’s solution was to use a field programmable gate array (FPGA) for extra-fast processing and an algorithm for high-density mounting (maximizes FPGA processing) at 30 frames per second (fps). 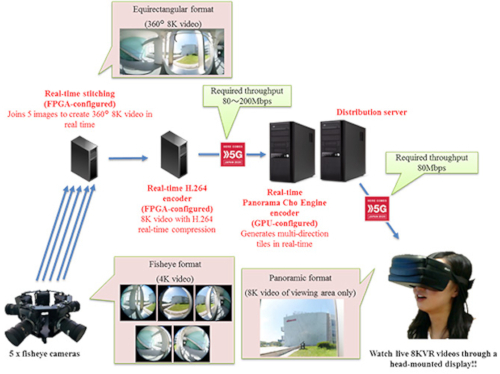 To view video in the head-mounted display, the 360° 8K video is divided into multiple clipped videos (tiles) so that only the video corresponding to the user’s viewing direction needs to be displayed. In addition, a Panorama Cho Engine™ encoder is used for devising algorithms that enable real-time operation, thereby reducing the processing demands for live transmission. The system comprises equipment that stitches together five 4K fisheye videos from five outward-facing cameras in real time at 30fps, an 8K H.264 encoder for real-time compression, the real-time Panorama Cho Engine encoder to divide the 360° 8K video into multi-direction tiles, and a server to transmit tiles according to the user’s viewing direction. This system will be exhibited at DOCOMO 5G Open Lab™ Yotsuya, which offers several 5G technologies for testing in collaboration with more than 1,500 companies participating in the DOCOMO 5G Open Partner Program. Going forward, DOCOMO will continue to develop high-quality VR technology to create new entertainment experiences for the 5G era. “Panorama Cho Engine” is a trademark of NTT TechnoCross Corporation.